I am so excited to begin sharing with you, in blog form, a monthly update on what KAI is doing to promote the Arts in the Kaneland Community. I hope that you will join me in our year round celebration of the Arts. Not many of you may know, but my background is in music. Music education to be exact, so to some degree, I’ve grown up being surrounded by performances – good and bad – all my life. “Performer” is not the word that I would use to describe myself, though, throughout college, performances were expected and as a teacher, public speaking was an essential part of all concerts. This past May, I stepped out of my comfort zone and auditioned for the Listen to Your Mother Show, a series of live readings about motherhood. It involved writing a 5 minute speech that I would read in front of a live audience with a cast of other speakers. I was surprised and pleased to be cast, as well as terrified to do an actual performance and a performance of my written word no less. The journey was quite an adventure and I loved just about every minute of it. Afterwords, I thought to myself how this format of performance was engaging, entertaining, and versatile. We could do this within KAI … easily. KAI’s Artistic Director, Diane McFarlin, who had come to see my Listen to Your Mother performance, agreed and suddenly, we had our opening event for the KAI season. 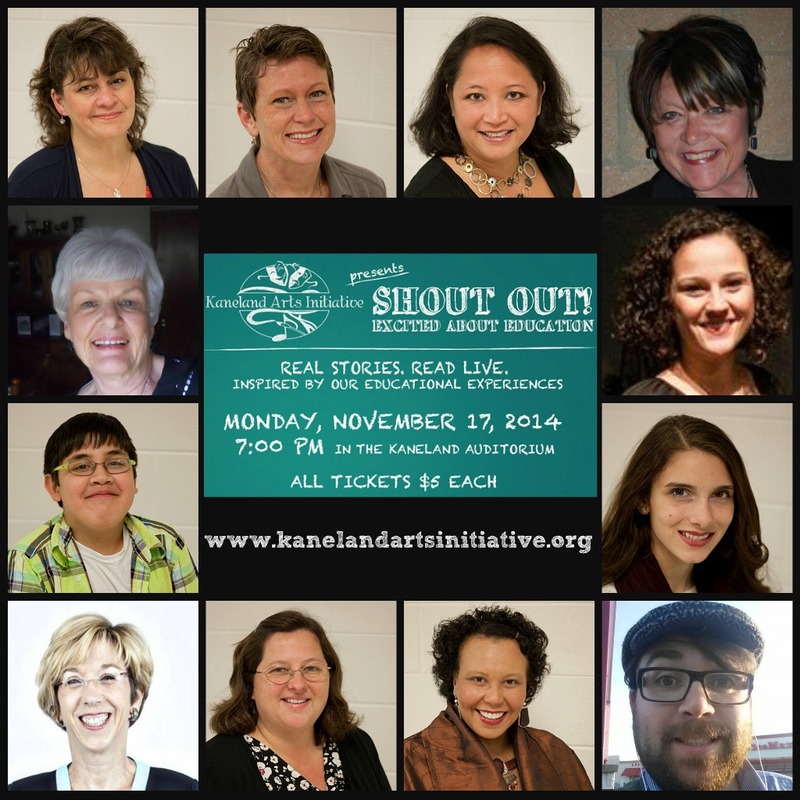 SHOUT OUT: Excited about Education is our stories, read aloud, inspired by our educational experiences. Cast members come from all walks of life from students to parents to teachers to community members. In conjunction with the National Education Association’s American Education Week, the event will take place in the Kaneland Auditorium on Monday, November 17th at 7:00 pm. Tickets are $5 each and can be purchased online at the Kaneland webstore (www.kaneland.org). I hope you will come. The stories are thought provoking and genuine, heartfelt and funny, and celebrate the inspiration that only comes from education. ← Great Theatre Opportunities at This Year’s Festival!